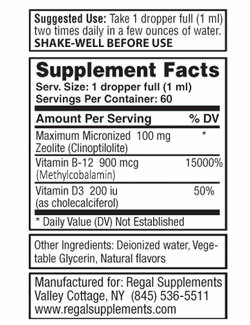 Zetox Zeolite Suspension, by Regal Supplements, helps remove the toxins and contaminants that build up in your body, as well as enhancing general immune function. This liquid Zeolite formula is the highest potency of Zeolite per serving than in any other liquid Zeolite product on the market. One serving helps deliver 50% of the necessary daily value of Vitamin D-3. Supports increased oxygen in the blood which helps transport the Zeolite throughout the body more efficiently for a more complete detox. Warning: If you are pregnant, nursing, taking medication or have a health condition, conuslt your doctor before using this product. Unlike other Liquid Zeolite products on the market, which use very small amounts of Zeolite mixed with water (that can grow dangerous bacteria), Regal Supplements ZETOX Zeolite suspension uses the highest amount of specially micronized Zeolite in a naturally antimicrobial base of proven beneficial vitamins which support more efficient use and benefits of Zeolite. ZETOX was formulated by the original pioneer of Zeolite supplementation.